https://lamechrecords.bandcamp.com/album/g-nget-ro-ljuset LAMECH records release: 180g heavy black vinyl limited to 500 copies with 12-page booklet. Cult Colombian Black Metal. 1993 EP re-released as 12" and limited to 250 copies.Come with two inserts. Small corner-ding due to shipping. Limited to 200 handnumbered copies on silver-white haze vinyl. Comes with inlay. Original first press from 2009. Side A: Promo tape 1990. Side B: Bonus tracks from "The Black Arts" (split LP with Varathron) 1991. Killer new MLP limited to 300 copies. Single sided 12"
12" Gatefold-LP with big booklet. Black vinyl. Split LP with poster and inlay. Limited to 300 copies. 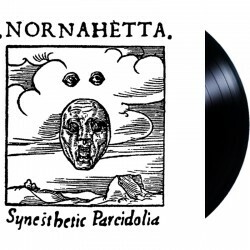 https://nornahetta.bandcamp.com/album/synesthetic-pareidolia-3 Limited to 200 copies on black vinyl. Icelandic drugged-out Black Metal with Misthyrming members,- Poly-lined white inner sleeve.- 140grs black vinyl.- 350 grs sleeve with 3mm spine, reversed print on white board.